Albany, Home of the First Plastic: Celluloid – Hoxsie! This was originally posted on my old blog back in 2010. This has some minor updates. For years I meant to get a picture of this marker, located next to a defunct Friendly’s restaurant not far from our old Albany neighborhood, where Southern Boulevard meets Delaware Avenue. The shopping plaza and the Friendly’s were brand new then, back in 1990, and I even had some vague memories of the big brick factory building that had been on the site just a couple of years before. home to the Albany Hyatt Billiard Ball Co. 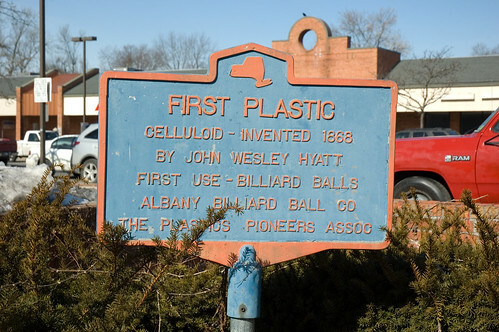 The marker proudly proclaims one of the least-known historic facts about Albany – that it was here that the first practical plastic, celluloid, was invented and developed into commercial products. While it has the appearance of an official Education Department historic marker, this was most likely a privately placed marker, perhaps installed when there was some controversy over the possible redevelopment of the site in the mid-’80s. Thanks to this marker, I’ve always been proud to know the location of the development of celluloid. Except, of course, that it’s wrong. While the final version of the Albany Hyatt Billiard Ball Company manufactured at this distant location, in the late 1800s this was farmland, part of the town of Bethlehem and served by the Normansville post office. The closest thing to industry was a paper mill on the Normanskill. And the location of the factory isn’t the only cloudy part of this story. Whether celluloid was invented in 1863, 1868 or somewhere in between, Hyatt filed for a patent in 1865 (granted in 1870), and continued working as a printer for several years, living at 32 Chestnut St. and later at 149 Spring St. He must have been working on business arrangements during that time. In 1867 Hyatt was with Osborne, Newcomb & Company, checker manufacturers at 795 Broadway. By the end of 1869 Hyatt had turned his invention into a number of commercial products, all being manufactured in Albany. In that year, the Osborne, Newcomb was sharing space with the Hyatt Manufacturing Company, making billiard balls, checkers and dominoes at 795-797 Broadway (now a gas station/convenience store just north of Livingston Avenue). By the end of 1871, the billiard balls were being made by the Hyatt Manufacturing Company at 19 Beaver Street, just west of Broadway. His brother, Isaiah Smith Hyatt, took up the checker and domino business as the Albany Embossing Company, a few blocks south at 4 and 6 Pruyn St. The material was also apparently put to pioneering use in dental plates, by the Albany Dental Plate Company. Despite numerous references to this company in the histories of celluloid, I find no reference to this company in the city directories of the time. The history of the company gets foggy from there. One account says that the Albany Dental Plate Company changed its name to the Celluloid Manufacturing Company and moved to Newark, New Jersey, in 1873. By all accounts, the Hyatts did move to Newark and developed new machinery and new uses for celluloid. In 1881 they founded the Hyatt Pure Water Company, and ten years later Hyatt established the Hyatt Roller Bearing Company of Harrison, New Jersey. He was even an early bio-fuels enthusiast, converting spent sugar cane into fuel. Honored by the Society of the Chemical Industry with its Perkin Gold Medal (named in honor of the inventor of mauve) in 1914, Hyatt died in Short Hills, NJ, on May 10, 1920. But J.W. Hyatt’s move to New Jersey wasn’t the end of celluloid manufacture in Albany. “The Albany Billiard Ball Company was organized in 1875, succeeding the Hyatt Manufacturing Co., organized in 1868, which was the pioneer manufacturing company in the world to make composition billiard balls. The factory, corner Grand and Plain streets, is a three-story brick building, 68 by 50 feet in dimensions. The billiard balls are now made from bonsilate, a product of another Albany industry, which is mentioned elsewhere. The colors of bonsilate balls are permanent, and they will not burn. Pool and bagatelle balls are also made. The officers are: Peter Kinnear, President and Treasurer; J.W. Hyatt, Vice-President; Louis Dietz, Secretary; and B.P. Wayne, Superintendent. “Nor does his identification with this community stop with his interest in this business, since he is also President of the Albany Billiard Ball Co., President of the Bonsilate Button Co., and a Director in both the Bonsilate Co. (limited) and the Newark Filtering Co. With the history of the manufactory of billiard balls in Albany, Mr. Kinnear’s name is prominently identified. The most unique industry in Albany and, indeed, the only one of the kind in the world, is that of the Albany Billiard Ball Company. This Company was organized in 1875, and is the legitimate successor of the Hyatt Manufacturing Company, organized in 1868, which was the pioneer in the attempt to make composition billiard balls. It is not our purpose to go into the details of the trials and failures of the original organization in its experiments to produce billiard balls of pyroxiline and later of celluloid that would take the place of ivory. Let it suffice to say that thousands of dollars were spent and much valuable time lost in experimenting with little or no practical results, until the formation of the present Company, since which time, by the use of perfected processes and machinery, the invention of J.W. Hyatt, the Company has succeeded in producing billiard balls that are more perfect than ivory balls, while at the same time they are far less expensive. Through 1899, at least, Albany Billiard Ball Company remained on Grand Street, at the corner of Plain, a site now covered by the South Mall Arterial. It’s the close of the century and we’re still nowhere near Delaware Avenue. But at some point there was a move to Delaware Ave., for by 1928 (there’s a big gap in available directories online), ABB was finally at our “historic” site at 483 Delaware Avenue, with Ronald Kinnear as President and Treasurer, and Kenneth C. Ogden as vice president and secretary. And there it sat, quietly making billiard balls miles and miles from the original site of the manufacture of celluloid, decaying, waiting for redevelopment and the placement of a marker that commemorates an important event in Albany’s industrial history in exactly the wrong place. You could make an argument for putting the marker in front of the vacant lot at 795 Broadway, or as close to the corner of long-gone Plain Street as you can get, but celluloid was not invented way out on Delaware Avenue. i believe a classmate of mine from st. michaels college owned or ran the business. in the 80 or 90’s. first name bob cant remember last name. a guy named donnie gardner from rensselaer worked for him. I’ve looked at this sign bazillions of times, and it just struck me: the last line on the sign must be who paid to have it made and placed there. The Plastics Pioneers Association is still an existing trade group and Googleable. Some years ago, there was an excellent show on PBS called “Connections”. In one episode, Albany Billiards was mentioned in regards to sub-atomic physics.